BRENTWOOD, Tenn. (Nov. 30, 2016) – Tractor Supply Company (NASDAQ: TSCO), the largest rural lifestyle retail store chain in the United States, today announced that construction is underway on a new location in Coleman, the Company’s 189th location in Texas. The Coleman Tractor Supply store will be located at 2303 S. Commercial Ave., and will employ an estimated 15 full- and part-time team members. The store will be approximately 21,607 square feet, including sales floor and support service space. A fenced exterior space will be used for storage and displaying items such as fencing, sprayers and livestock equipment. The contractor for the project, Westmoreland Builders, began construction on Oct. 17. A completion date has been tentatively set for mid-January 2017. About Tractor Supply Company Tractor Supply Company operates more than 1,500 stores in 49 states. Located in the outlying towns in major metropolitan markets and in rural communities, Tractor Supply Company stores are focused on supplying the lifestyle needs of recreational farmers and ranchers and others who enjoy the rural lifestyle, as well as tradesmen and small businesses. The Company offers a comprehensive selection of merchandise for the health, care, growth and containment of horses, livestock and pets including select Purina and Nutrena brand feeds; hardware, truck, towing and tool products; and seasonal products, including lawn and garden items, power equipment, gifts and toys. In addition, the company sells work/recreational clothing and footwear for the entire family and maintenance products for agricultural and rural use. For more information on Tractor Supply, access the website at www.TractorSupply.com. Well the lights went out and the wheels came off the Mountaineers in last week's Bi-District playoff game against the Marfa Shorthorns in Grady. Marfa came ready to play and rolled past the 45 point favorite Mountaineers by a score of 94-79. The Marfa Shorthorns will face the Garden City Bearcats in Rankin Friday November 18th at 7:30. There will be a TAIAO D2 Semifinal sixman playoff game Saturday at Mountaineer Stadium according to sixmanfootball.com the Lubbock Home School Titans will host Bastrop Tribe Consolidated at Santa Anna Saturday 11/19, 4:00 Kickoff. The Santa Anna Mountaineers took on the Paint Rock Indians Friday and won the game by a score of 78-29 which give the District 8 Championship out right to the Mountaineers. 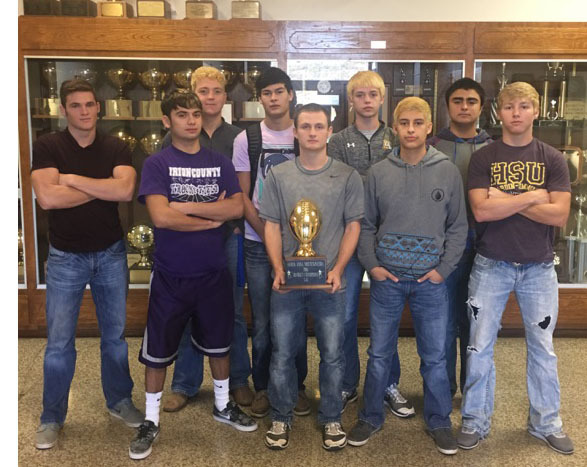 The Mountaineers will face the District 7 Runner-Up Marfa Shorthorns in the first round of the playoffs in a Bi-District matchup in Grady Friday, November 11th at 7:30. Grady is just North of Stanton and I-20 and this side of Andrews on highway 176. Santa Anna will be Home. The Mountaineers are ranked 16th in Division 1 and 38th overall and the Shorthorns are ranked 49th in Division 1 and 132nd overall. The Mountaineers are picked by 45 points according to sixmanfootball.com. The Santa Anna Mountaineers took on the Water Valley Wildcats last week in Santa Anna and came out on top with a score of 69-24 to go to 2-0 in district play. The 6-3 Santa Anna Mountaineers will face the 1-8 Paint Rock Indians in Paint Rock this Friday November 4th. The Mountaineers are ranked 16th in Division 1 and 34th overall and the Indians are ranked 36th in Division 1 and 196th overall. The Mountaineers are picked by 45 points according to sixmanfootball.com. I did not make it to last weeks game so I don't have any Water Valley game photos. 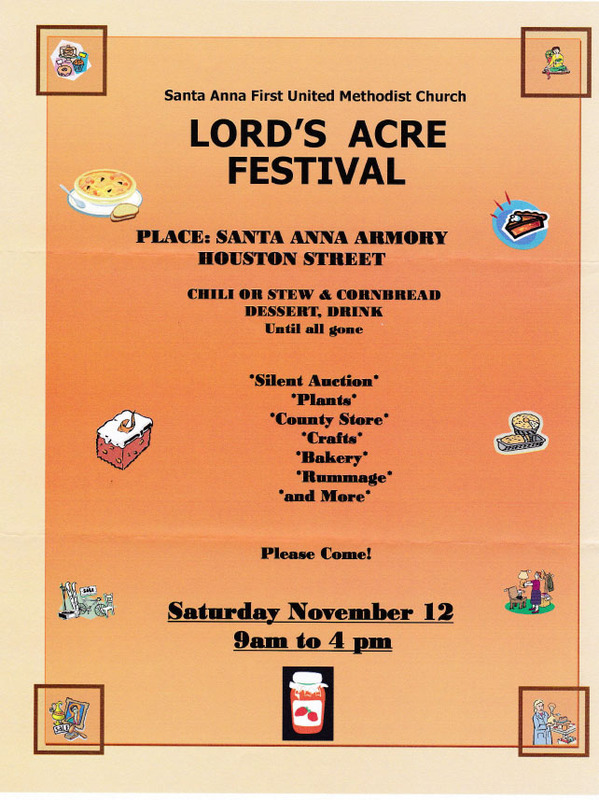 The annual Lord's Acre festival for the First United Methodist Church ot Santa Anna will bo on November 12th at the Armory building on Houston Sreet from 9 A.M. to 4 P.M.
Chili and stew will be served beginning at 11 A.M. Donations for the lunch wil lbe accepted. If you are looking for unique gifts or a special treasure, be sure to bid on the silent auction items or shop the garage sale inside the armory. Also the Country Store will be open with wonderful homemade crafts. Tastey home baked and home canned goods wil lbe available. Be sure to plan your visit between noon and 2 P.M. for live music presented by Don and Ginger Shirley from Bangs, Texas. Bids for silent auction items will close ate 4 P.M. Thank you for your contribution to the ministries of FUMC SA. Proceeds for this event will be used for the good of the community. See you all there!